The Twin Pack 1-Light Wall Sconces offer great value accent lighting for the home. Each sconce features a white opal glass shade and brushed nickel hardware. The intricate metal work and simplistic glass shape complement each other exceptionally well and will help dress up any interior decor. Each sconce requires one 60-watt medium base type A bulb which are sold separately. Here is a traditional wall sconce with up to the minute styling. With its Bronze finish it lends a classic touch to any room. Imagine a pair in your entry, hallway, dining room, living room, library or bedroom. By using it with a dimmer you can control the light level and create the ambiance you wish. 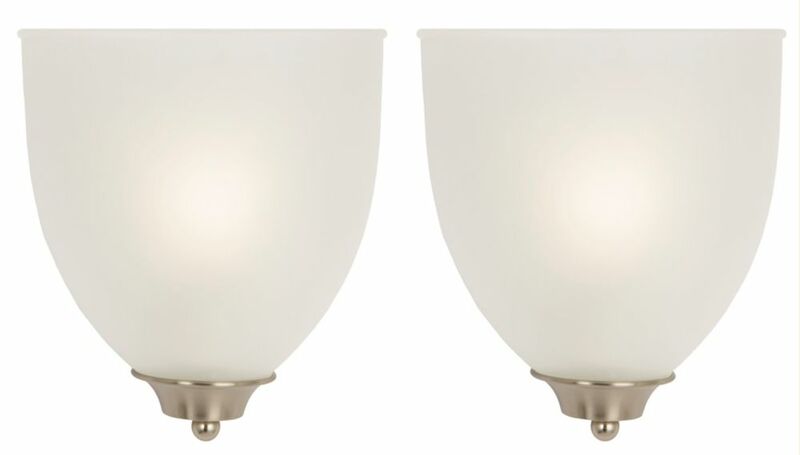 2- Pack Wall Sconce The Twin Pack 1-Light Wall Sconces offer great value accent lighting for the home. Each sconce features a white opal glass shade and brushed nickel hardware. The intricate metal work and simplistic glass shape complement each other exceptionally well and will help dress up any interior decor. Each sconce requires one 60-watt medium base type A bulb which are sold separately.